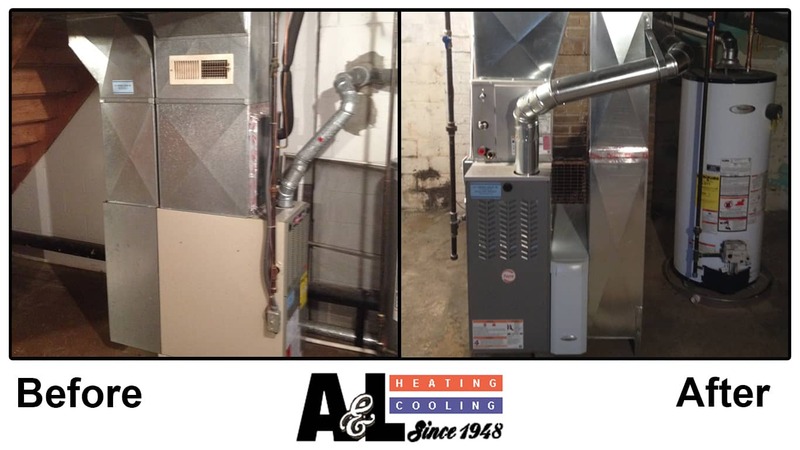 When it comes to furnace repair and servicing, nobody knows more than A & L Heating & Cooling. Since 1948, we have worked to service and install only the very best in heating systems to keep our customers comfortable. A thermostat is signaled by a sensor in the home when the temperature drops below the set level. The thermostat triggers the furnace to turn on and begin heating the home. The furnace’s gas valve opens, and gas and air combine in the combustion chamber. A pilot light ignites the mixture, which creates a flame to increase the temperature of the heat exchanger. Air enters the furnace and heats as it passes over the warmed heat exchanger. The warmed air, which is heated to an average 115 degrees, is distributed throughout the home through a network of vents and registers. The thermostat senses when the temperature reaches its set level and signals the furnace to turn off. 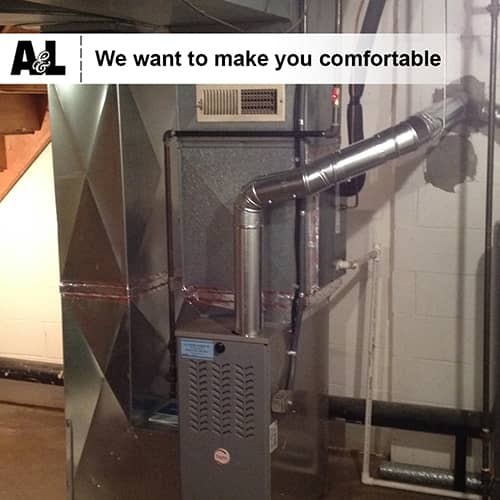 As a top heating and cooling contractor in Canton, Ohio, A & L Heating understands the importance of installing the right size and style heating system to provide the most energy efficient comfort for your home or business. Our trained technicians analyze a home’s size and needs to recommend the most appropriate heating solution to our individual customers. Most American homes are heated with furnaces, and natural gas is used by over half of Americans as their dominant heat source. It is the cleanest burning of any other fossil fuel. 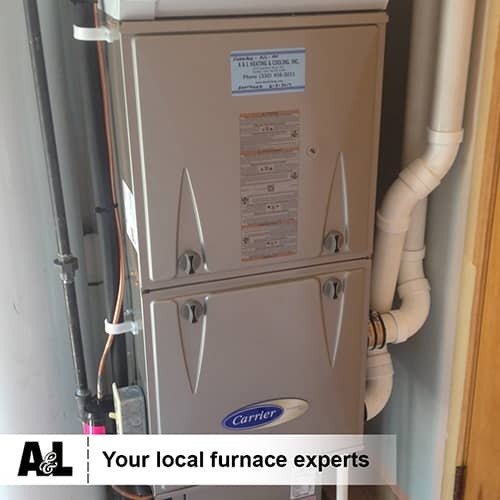 A furnace’s efficiency is measured by annual fuel utilization (AFUE), which measures how efficiently the furnace converts the natural gas into heat in a year. For example, a furnace with a 90% AFUE means that 90% of the energy in the fuel becomes heat for the home while 10% escapes. An AFUE is displayed on the furnace so consumers can compare the efficiencies of different models. This is required by the Federal Trade Commission. It’s important to remember that the AFUE does not take into consideration the amount of heat lost through the ducts or piping. All-electric furnaces are available, with AFUE ratings ranging from 95% to 100%. Homeowners should, however, consider the cost of electricity in their area, as higher costs can overshadow the savings from the higher AFUE. 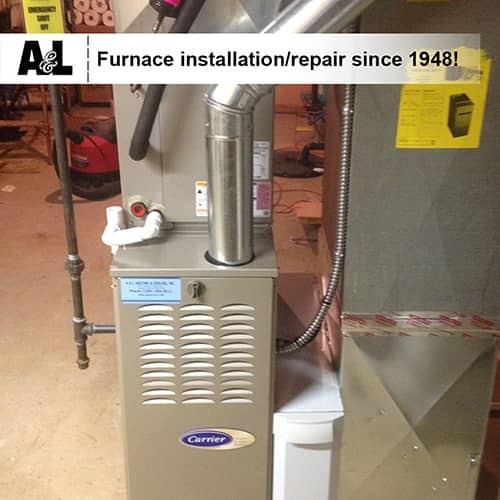 At A & L, our skilled technicians may be able to help you by retrofitting an old furnace to improve its efficiency. Ask us about upgraded duct work, implementing all-house zoning and installing programmable thermostats. We are happy to save you the cost of replacing your heating system if we can help you upgrade your older, inefficient furnace. Such efforts also assure the safety of your furnace’s operation, and you can rely on our experts to advise you if it makes more sense to replace your furnace rather than spending to retrofit an old one. Check the condition of your vent connections. These include ducts, pipes, and chimneys. Check for deterioration. If the chimney needs repair, which can be costly, consider converting to a new system that would not use the chimney. Check the heat exchanger. The heat exchanger of a boiler system leaks water, which is easy to spot. The heat exchanger of a furnace leaks combustion gases, which are invisible and dangerous. For your family’s safety, a professional inspection is crucial. Adjust the controls of the furnace to provide for both efficiency and comfort. Perform a combustion-efficiency test if you are considering replacing or retrofitting your existing system. Homeowners can keep furnaces running at top efficiency by regularly changing air filters and keeping the area around the furnace clean and free of clutter and debris. Any other servicing is best to leave to professionals, both for safety and to maintain warranties on the unit. 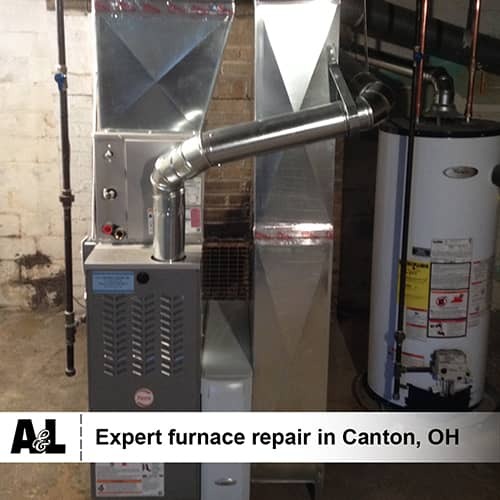 Furnace repair and installation can be a challenging task. A furnace affects not only the comfort of your home, but also the safety of your family. With so much at stake, for your home and your family, why would you entrust such an important job to just anyone? Use the professionals here at A & L. We promise great service, dependable technicians, and a quality product for your home at a fair price. Contact A & L today, a more comfortable home is just a phone call away. We proudly provide services for Alliance, OH; Canton, OH; Louisville, OH; Massillon, OH; North Canton, OH; Hartville, OH; Minerva, OH; Greentown, OH; Paris, OH; Uniontown, OH; Middlebranch, OH and all the areas near and in-between. If you are looking for a heating and cooling contractor in any of these Northeast Ohio areas, contact us.